Artigo apresentado no 17Th International Simposium on Electronic Art, em Istambul, 2011. Data Visualization and eco-media content. Juan Freire / UDC, Spain. This paper presents an analysis of the material produced during the “Digital Narratives for community participation on coastal ecosystem management” workshops held in Garapuá, Brazil and Aguiño, Spain (http://narrativas.ecoarte.info/). It is a reflection on the themes and contents identified and collected by the teenagers. Alongside our analysis tries to facilitate the exploration of the materials to users and to identify topics and problems relevant to the participants, their communities and territories. Here, art and ecology get together to produce a visual and conceptual narrative of these peoples’ lives, culture, economy, religion, territories, landscape and so on. The workshops were facilitated by a group of artists and scientists that worked together to get a picture of these two places and see their connections, similarities and discrepancies. Digital media has allowed the development of narratives by a diverse array of communities and collectives that previously were overlooked because they are marginalized. Instead of a well-defined and finished product, these digital narratives are a continuous process of documentation and reflection based on individual and collaborative contributions using different formats, channels and media (audio, video, photo, mapping). In this sense, narratives could be considered platforms for art experimentation, learning and debate. The objective of these projects is to produce “other” narratives paying attention to subjectivities and explanations of the environmental, social, political and economic problems and idiosyncrasies differing from the narratives offered by mass media and/or political bodies. In this sense, these alternative narratives provide visibility of hidden realities making them explicit to other stakeholders that otherwise would prefer to ignore them, putting in some way problems and collectives in the agenda of the decision-makers. So, digital narratives are media and tools for negotiation both internal (inside communities with the goal of attaining consensus in objectives and strategies to solve common problems) and external (with powers that make policies and manage these communities and their territories). 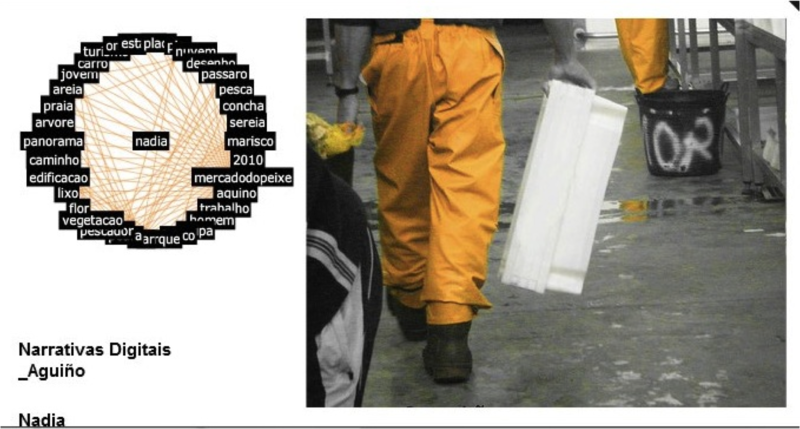 The present paper is based on the experience carried out in the project “Digital Narratives for community participation on coastal ecosystem management” that was developed in two coastal rural communities dependent on fisheries: Garapuá (Cairu) and Aguiño, coastal places located in Brazil (Bahia) and in Spain (Galicia), respectively. Both communities are representative of the diversity of cultural and socioeconomic conditions that characterize coastal fishing communities in Spain and Brazil. Garapuá continues to be a small village mostly isolated from nearby human settlements and where a strong feeling of community continues to persist. Whereas, Aguiño has experienced an important urban development in the last years and now this village is part of a large diffuse coastal settlement mixing rural and urban characteristics. In this Spanish site, people are less tied to the place and participate in wider social networks. It’s expected that these socio-cultural differences are reflected in the vision that each community has of itself and its territory. In both communities, experimental workshops combining artistic practices, new media and science were carried out for the creation of digital narratives dealing with ecological, cultural and socioeconomic issues in two coastal communities is here illustrated. Our basic hypothesis was that digital media could allow coastal communities to develop their own narratives about their life and territory, and especially their use of coastal ecosystems. This process can be essential to promote mechanisms of community cohesion and to empower user groups to participate more actively in the co-management of their territories, along with scientists, public officers, politicians and other stakeholders. A previous paper (Brunet & Freire, 2010) explained the motivation of the project, the workshop development, and a preliminary description of the main materials produced and results.The workshops were designed as a pilot project where methods and technologies for collaborative construction of digital narratives were assembled, tested and improved for the development of a collaborative framework. A toolbox of open methods and free software was brought together to facilitate future projects. The complete process is documented can be found on site of the project (http://narratives.ecoarte.info/). 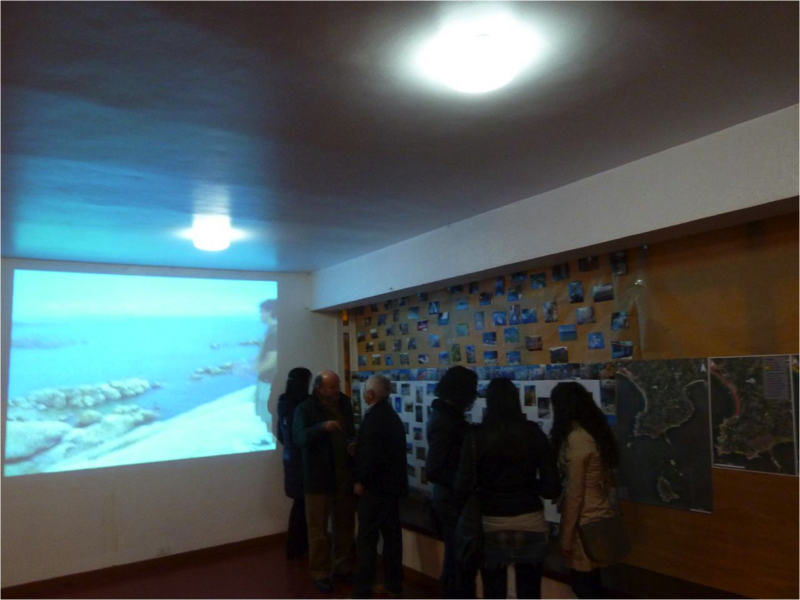 In each place, exhibitions were carried out to present the results allowing people to know, discuss and compare their narratives with the ones from the other site. Both exhibitions and digital repositories can help to promote reflection and action about the identity and problems inside each community. Here we present an analysis of the aesthetical and ecological content of the narratives produced during the workshops. We also present a description of the ongoing experimentation to visualize narratives (media, semantic content and geographic patterns). Through creating these digital narratives, teenagers from both communities gained confidence and appreciation of their territories. In a brainstorm for the Aguiño photo workshop, we asked: “how do you see your future here, in this town?” The answer was “In the future, here it will became an abandoned town or a big city”. This states their view of the place as two extreme directions: one is the disappearance of the town due to migration towards cities (teenagers visualize themselves as part of this diaspora), or Aguiño becomes a suburban part of a larger city due to the development of nearby urban areas. After the workshop they stated that they realized that their place had other opportunities that they haven’t imagined before. And that yes, they could do things there in order to preserve their landscape and not having to leave town. Allen Carlson (2000) defines the relevance of landscape appreciation on environmental aesthetics and its descriptions modes. Using literatures as example, he suggests that landscape appreciation is proposed by different sorts of descriptions such as: formal and ordinary description, factual description, and imaginative description. All of those are easily seen on the media produced on Digital Narratives workshops. Photos of beaches landscape from Aguiño and Garapuá are examples of ordinary description; they present the place as a postcard, very clean, distant and with no interference. The video of a worker opening the coconuts is an example of factual description since they present the action as an investigation about the man’s work, it presents the functionality of his act. And an example of the imaginative description is the map of legends created in Aguiño that display the location of the legends of their place, in there, they say that almost every rock in the sea has a legend. The way we experience the environment as an art form can change from person to person, in our case, from community to community. In one community, for example, landscape appreciation can be the most important factor, while to the other, the contestation and memory can be more significant. When comparing the results of the aesthetical experience of the two communities, some considerations stand out. For example, in Garapuá many of the teenagers had no previous knowledge on using the cameras, mp3 recorders and GPS, so their use and technological experimentation was more conventional than the use done in Aguiño, a place where the teenager were already used to the technology. This can be easily seen on the photos produced on both communities, the Garapuá’s ones were more a documentation of their territory and community while in Aguiño, there was a graphical aesthetics concern to the photos. Meanwhile, the images produced in Brazil had a stronger narrative content and the ones done in Spain were more landscape contemplation. In Aguiño, observing the photos produced we can see that landscape appreciation was mandatory for the teenagers to narrate about their territory. While in Garapuá, they focus the importance more on people than on places. Maybe that is related to the familiarity of the teenagers in Garapuá to other members of the community. When photographing they were interacting with their friends, uncles, grandmothers… In the Spanish community, frequently, they had no close relationship with the people photographed, not even knew their names. The audio recording produced in both communities also had different approaches. In Garapuá, there was no experimentation with the audio, they recorded many storytelling, and many times, all recorded the same situation. We ended up with many audios of the same interview. On the other hand, in Aguiño they experimented a lot with the audio, they created and discovered unnoticed sounds of the place. An interesting example is an orchestra that they created on a shipyard, just with the sounds of the machines. With the sounds produced we believe it was not a question of being comfortable with the recorder, the different results were more related to the effort and experience of the facilitators who could stimulate them to search for different perspectives. Here we can see clearly the importance of the role of the facilitator, in Garapuá, they only focused on the technical aspects of the sound and the editing software. Noticing that problem on the first workshop, we asked the facilitators of Aguiño to work more on the content of the audios than on the technical aspects. …if aesthetic experience is … a matter of pleasure derived from perception involving both senses and intellect, then it is more than just a question of seeing – it takes time. Time to allow sensations to impinge on our time for reflection on the meaning and impact of what we have experienced. We believe that in Digital Narratives project, the aesthetics was not only a question of seeing, it was a question of acting, the teenagers had to take part of the project. The aesthetics experienced involved action and reflection on their place and territory. It was based on the complexity of the engagement, on the way they were asked to sense their community, through the digital media. The coastal ecosystem is the context where the lives of these communities and peoples occur. Ecosystems are characterized by a series of “tangible objects” (physical and biological components) and intangible processes that connect the different objects (i.e., river runoff or coastal currents, coastal fertilization, trophic cascades…) (Mann & Lazier, 2005) and the human experience of objects and processes gives rise to the landscape (Turner et al., 2001). The work of workshop participants and the comments of the people interviewed shows us how they perceive their ecosystems and landscapes, and specifically which objects and processes they are aware and/or consider relevant and which ones are hidden. In this sense, this kind of analysis could be of great utility to assess the ecological literacy of the community (Jordan et al., 2009); their ability to understand essential ecosystem processes that support the sustainability of their natural resources and ecological services. Our analysis of the contents produced during workshops demonstrates that teenagers have only a basic knowledge of the ecosystems. Also, this fact precluded them from engaging in depth in ecological conversations with people. A global analysis of materials allowed us to identify 6 main themes relevant for Garapuá’s teenagers: 1) tourism / leisure, 2) infrastructures, 3) economic activities (especially fishing), 4) life histories, 5) ecosystem and 6) land ownership. Teenagers showed a strong capacity for critical thinking about their own identities and the result of their work presented an accurate description and critical analysis of the community and the territory. However, they only identified the basic elements when working with the ecology of the area: habitats (mangroves, beaches, reefs), animals and plants (especially trees and commercial fished species as clams or some fishes) and physical elements (water, small rivers…). In the case of Aguiño, teenagers had a more contemplative and aesthetical attitude towards their environment, although the workshop and posterior discussions helped them to start to develop a certain critical thinking. In this sense their materials were more descriptive documenting a static nature and landscapes and they identified three main topics: 1) landscape, 2) fishing, and 3) life histories and cultural identity. They were mainly focused in large landscape features as beaches and coastal geological formations, and they were only aware of commercial animals only when they accompanied fishers in their operations at sea and/or at markets. Some basic ecological processes that are conflictive in the community, as pollution by sewage or processing industries located in the seashore, were also registered. However, only a basic analysis was documented and no in depth discussion was provided by their work. Jointly, the narratives of both working groups allow identifying that ecological literacies are basic. Only the more symbolic and evident “objects” are recognized. Also some relevant “objects” as habitats or vegetation types and almost all ecosystem processes are not identified showing a static view of the landscape. They lack a conceptual view of their territory as a entangled network of objects and processes where any action affecting one component produces changes in other components and locations, and in this sense, their ability to understand how to manage the ecosystem is restricted. Some basic ideas lacking from the narratives are related to: effects of nutrient discharge in coastal fertilization, trophic dynamics of the biological communities, effects of overfishing in the abundance of resources and cascading effects in other species, or habitat changes by human disturbances. Developing a comprehensive ecological literacy arises as a key objective to empower the community and develop their ability to influence decision-making in environmental management (i.e., territory planning, pollution control, fishery management). These topics are especially important because the economy of both communities is dependent mainly of artisanal fisheries and, to a lesser extent, a growing tourist activity that uses ecosystem services and it is dependent of landscapes. Effective participation of communities in environmental management needs both an ecological literacy and capabilities for collective action allowing them to negotiate with managers and politicians. Digital narratives arise as a tool to improve both topics. In a first phase, corresponding to the workshops described here that started with a rather general goal, the construction and analysis of narratives is a way to identify the baseline of the community about their ecological knowledge and their attitude about the environmental problems and risks. Future workshops could be more focused. For instance, facilitators could work with teenagers to show and discuss ecological processes and landscape dynamics and sustainability, and narratives could be a way to document and visualize these processes and to investigate how they operate in their locations. Other workshops could be focused on organizative aspects of the community, the existence (and/or the development) of a consensus about their main problems and about the actions needed to solve them. In this sense, in Garapuá, the concentration of land property in a few hands (external to the community) was identified as a basic problem. Actually it was the only problem and conflict related with the management of the territory and ecosystem that was identified in the workshops. Decisions occurring out of the community could modify land use, i.e. with the building of large touristic resorts, modifying habitats and probably basic ecosystem processes as coastal erosion or reef deterioration, and traditional uses of coastal locations as beaches used as landing and boat repairing places or residential houses occupying the shore. The workshop demonstrated that although the problem is recognized, there is not a basic consensus about how to approach collectively this risk and which could be the solutions. Something similar occurs in Aguiño with conflicts between fisheries and coastal pollution and between fishers’ organization with the regional government. In this area fisheries management has not be able to solve overfising and local fishers organization claims a change towards co-management and the use of territorial users’ rights. This debate is a topic of considerable interest but surprisingly teenagers were not aware of it. Art, being here a subtle form of communication and protest, uses data visualization to empower community members allowing them to visualize, and realize, facts that were sometimes misplaced, or hidden, or forgotten. The cataloguing and careful handling of the media produced during and after the workshops has a key role in this visualization. We have tagged all photos, videos, maps and audios in relations to its content in order to find patterns of significance on the material produced. At the same time, we explored software and graphical possibilities of this visualizing process. 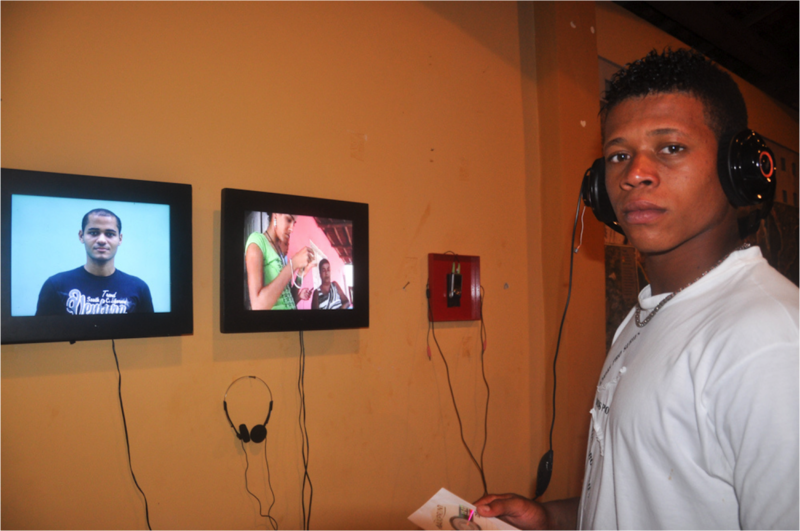 The exhibition we did in both communities was a form of presenting the visualization of the material they have produced. We created a parallel of video projection, mixed photos by themes, played audio as content title, and printed large maps showing their territorial choices. We also placed photos on topographical maps of both regions helped by the workshop partakers. Besides the physical exhibition in the communities, we presented online all the material produced, this way, giving a broader visibility to the work. In order to better understand the internal relationship of the content produced, we did tag visualization of all the photos produced. We used Impure software to create Datanet (Klanten, Bourquin et al., 2008), a visualization in which the links between the objects are more important than the nodes. This visualization gave us a better perspective of what was important to them, about their location, environment and identity. After we have finished the workshops and exhibitions, we concluded that we needed more time in the community for collaboratively editing and tagging the material, and more important, for their assimilation of the work they have done. It would be necessary a longer and more continuous work with them in order to engage a deeper reflection and discussion on the material produced. We agree with Mark Dawes (2008: 65), in “Beyond Process: Art, Empowerment and Sustainability” when saying: “A process-based model can be a highly successful approach to working with people in the arts, but the short-term nature of most projects of this kind limits more profound possibilities for growth within communities.” However, our problem the length of workshops was not a decision implied only by us, the teenagers did not much free time either, many of them studied and worked fulltime. Additionally, it could be hard to keep their attention and focus on a longer period. So we had to condense the most in a few days, otherwise we would not have public. In parallel we identified the need for more experimentation in the visualization of media and their semantic and geographical content to refine and improve tools and results. Visual interfaces should be the basic tool allowing people in communities to explore materials produced. Therefore, allowing them to get insights and develop reflections about the topics narrated at workshops. The workshops and research presented in this paper show the opportunities that the concept and method of digital narratives represent to develop art and ecological literacies and to empower communities for participation in environmental management. This project was funded partially by the AECID (Agencia Española de Cooperación Internacional para el Desarrollo) and with a research grant of FAPESB (Fundação de Amparo à Pesquisa do Estado da Bahia). Carlson, A., & Berleant, A. (2004). The aesthetics of natural environments. Peterborough, Ont. ; Orchard Park, NY: Broadview Press. Dawes, M. (2008). Beyond Process: Art, Empowerment and Sustainability. In G. Coutts & T. Jokela (Eds. ), Art, Community and Environment. Bristol, UK; Chicago, USA: Intellect Books. Klanten, R., N. Bourquin, et al. (2008). Data flow: visualising information in graphic design. Berlin, Gestalten. Mann, K., J. Lazier (2005). Dynamics of Marine Ecosystems: Biological-Physical Interactions in the Oceans. Wiley-Blackwell. McWilliam, A. (2008). Developing an environmental aesthetic: aesthetics and the outdoor experience. In G. Coutts & T. Jokela (Eds. ), Art, Community and Environment. Educational Perspectives. Bristol, UK; Chicago, USA: Intellect Books.